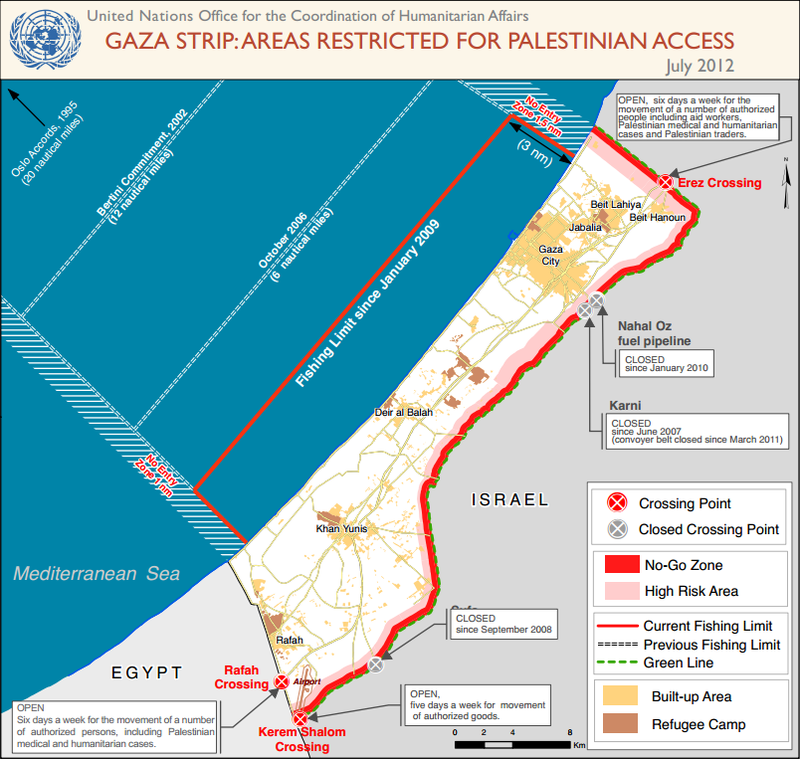 The basic problem faced by the 139-square-mile strip bounded by Israel and Egypt can be summed up fairly succinctly: Gaza will have to support more people with fewer resources using infrastructure already buckling under pressure while under severe restrictions for building more. A number of factors contribute to the dismal outlook, but the report singles “the current political status quo” for particular emphasis. The basic infrastructure and demographic issues are challenges no matter what, but the Israeli and Egyptian blockade of Gaza’s borders and continuing conflict with Israel make normal movement of goods and people much more difficult. However, while acknowledging the role that politics plays in Gaza’s plight, the report leaves an in-depth analysis of their complexity to others and instead keeps a strict focus on the problems affecting everyday life, from food and water insecurity to high unemployment and a lack of basic health, sanitation, and education services. With a total fertility rate of 4.9 children per women as of 2010 the population of the Gaza strip is expected to grow by nearly one-third in the next eight years, from 1.6 million people today to 2.1 million. Population density would be 5,835 people per square kilometer in 2020, placing the territory just behind the city-states of Macao, Singapore, and Hong Kong as the most densely populated in the world and making it nearly 15 times denser than Israel with far less developed infrastructure. Gaza’s population has outpaced economic growth since the 1990s, with real per capita GDP shrinking by 88 percent in spite of GDP growing by 23 percent in 2011 alone. Similarly, unemployment is worse now than it was in the 1990s, at 29 percent. Women and young people are disproportionately affected, with 27 percent of women and 58 percent of 20- to 24-year-olds out of work. The report credits the five-year-old blockade of Gaza’s borders as “one of the main reasons” for economic and employment shortfalls. Without jobs at home, and without the ability to emigrate in search of work elsewhere, “social tension, violence and extremism” could become “possible outlets for lack of meaningful prospects,” the report warns. An immense undertaking would be needed to bring supply of these critical infrastructure components in line with current demand, much less the demand projected for 2020. Limited land, intense urbanization, the blockade, and insecurity make needed infrastructure projects extremely difficult to achieve, however. Water and food supplies, already stretched thin, will also become increasingly scarce over the next eight years. Meanwhile, in spite of UN food distribution to more than two-thirds of Gazans, more than half are either food insecure (44 percent) or vulnerable to insecurity (16 percent). Growing demand for housing cuts down on already limited agricultural land, one-third of which is already difficult to access because of its proximity to buffer zones with Israel. A increasingly tight boundary imposed on fishermen in the Mediterranean – initially 20 nautical miles under the 1995 Oslo Accords, now a mere 3 nautical miles – has resulted in available fish stocks decreasing “dramatically,” cutting out an important source of protein from Gazan diets. Ultimately, “on-going herculean efforts by Palestinians and partners” must be “accelerated and intensified” for Gaza to be “livable” in 2020, according to the report. The report’s recommendations can be divided into two general categories: ones that cannot be accomplished without Israeli participation, and ones which can, but whose success will be inherently limited under the political status quo. Some of the most immediately beneficial recommendations depend on Israel – ending the blockade and expanding access to the Mediterranean, for instance. Others, like adding 800 hospital beds and building 440 schools to accommodate the growing population, could be done without any change to the political situation, but would be much easier to achieve if a resolution between the two states was achieved. Of course, the UN’s recommendations enter one of the most difficult and charged political environments in the world, and any action by Israel would surely require something from Hamas. But the report states in no uncertain terms that the cost of inaction – in the form of continued violence, a humanitarian crisis, and socioeconomic disintegration – is simply too great to ignore. “Without such action, the daily lives of Gazans in 2020 will be worse than they are now,” the authors conclude. Sources: UN, UN Population Division, UN News Centre, World Food Programme. 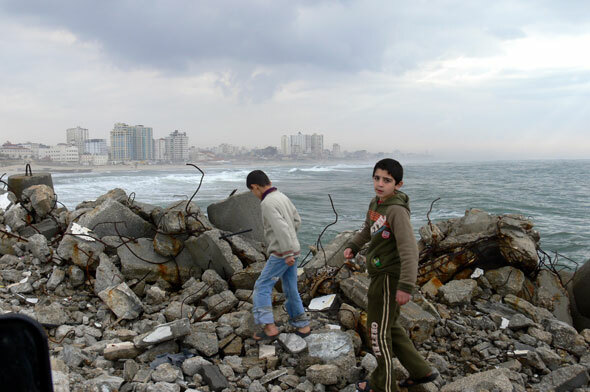 Photo Credit: “Gaza,” courtesy of flickr user MarcinMonko. 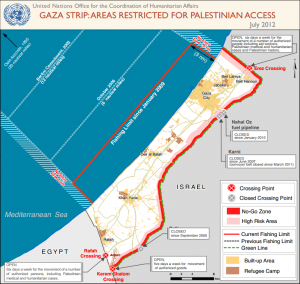 Following the recent ceasefire between Israel and Hamas, Gaza’s fishermen are now (at least temporarily) able to fish 6 nautical miles from shore, twice the distance allowed under previous Israeli restrictions. Of course, the situation remains complicated; Israel denies that it has agreed to the extended nautical boundary, even though the markers its navy once maintained at the three-mile mark have been removed.